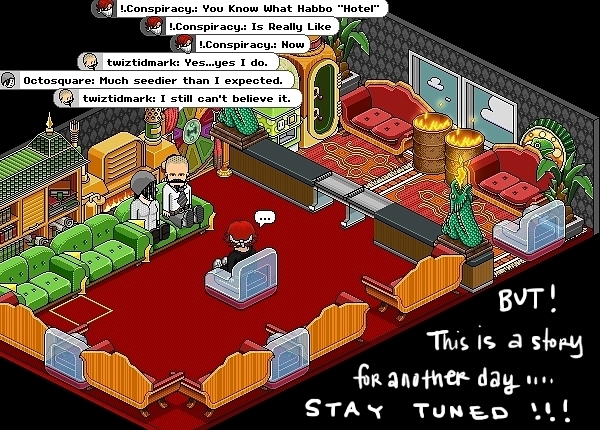 Habbo Hotel has been around since practically the beginning of the internet as we know it. Several of us have been held in its thrall, and maybe still go back to it from time to time. Maybe we are going to it today, in the present year of 2017. At any rate, it seems like a good idea to get the boot in the door and write a first article introducing our readers to the concept, as though you don’t all secretly keep accounts there, yourselves. I have been discussing it with everyone’s favorite Southern Man, Mr. Billy Holiday (my frequent cohort at the hotel a few years ago and actually he might have been on there far more than I actually was). We have realized that there were so many happenings over so many years that there are a few articles within us about this place, this should-be-totally-defunct place. But what is it? My first visit to this incredibly lame internet chat spot was probably in 1999 or 2000 – actually BEFORE I knew anyone here that makes up the site you are reading now. My then-boyfriend’s college friends had found this little diverting place called “Habbo Hotel” and it was full of British people because we only ever used the co.uk version for some reason. It was kind of cute. The habbos (hint: that is what the denizens of the place were called, conveniently enoug− OMG INHABBOTANTS) were ugly, and really limited in what you really could do to interact. Wait am I getting ahead of myself again already again? To be honest, saying “inhabbotant” wrecked my concentration. As with many sites, you had to register to be a part of the magic. You selected a username, provided a valid email address, and designed a little character who was going to represent you throughout all of your dealings and doings. I don’t mean THOSE kinds of doings, but according to 99% of all interactions with strangers on there, that is exactly why everyone else was there. You could change your habbo’s appearance as frequently and easily as you liked, but your name always remained the same. At first, you really couldn’t change that easily because the Internet was new and on wobbly feet, and so this site, which relied heavily on “good connections” and “lots of moving images on the screen” was a little beyond the capabilities of many computers of the time, including my own. Frequent freezing and crashing was the order of the day. It was the order of the day right up until like 2003 or so, I really can’t imagine why I kept going back. Although, really we only went a few handfuls of time. It would be fun for a few days, then we would not go back for months or years. I want you to know that. What Could We Do That Was So Special? Habbo Hotel was like the forerunner of such exciting sites I never used such as… Any of the ones I used to see on internet banner ads that had “avatars in a 3D environment.” Is one called imvu? [Ed. note: Second Life?] I really don’t want to do any kind of research at all for this. I figure you know what I am trying to mention though. The primary difference between Habbo and every single other such site is that at the hotel the action options given to you at the time were only “dance” and “wave.” Yes. That is all. Even when they could have easily updated with new animations and better quality of characters and activities, they never ever did. You went to Habbo Hotel to see the internet frozen in the year 1999, with no hope of ever improving. Oh wait, I tell a lie. In 2005 or so, they introduced some strange “friend pager” kind of thing where you could track your friends better and send them little messages and the like. I would not call that an improvement though. I will get to the “interacting with each other” part in more detail in a little bit. Because I feel, intuitively, that I should explain the setting a little better. By which I mean “at all.” The hotel really was made up to be a hotel! A big one. You start out with your very own room which you could name, decorate, and set as “Private” or “Public.” There were also larger public settings such as a cinema, a lobby, a pool, a night club, and so on. The one thing Habbo Hotel succeeded in was the Hotel setting. 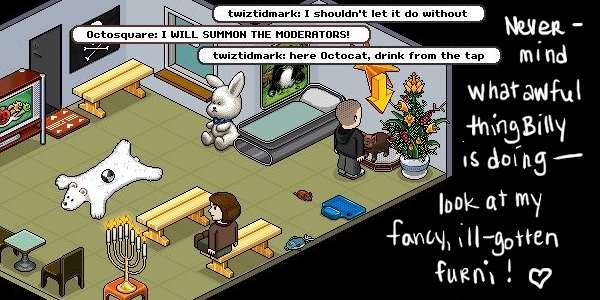 The public rooms would have been a lot more fun, but they always seemed to be populated by the lowest forms of Habbo users: furni-traders, scam artists, and pre-teens looking for a romp between the gently-used hotel sheets. 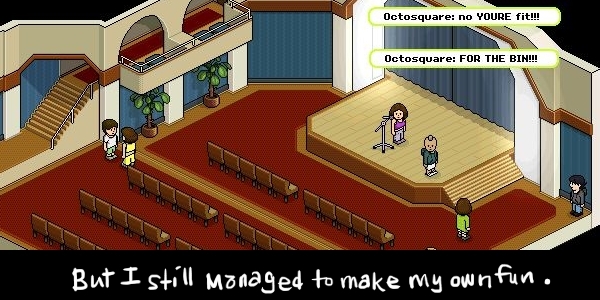 But those were the places where you could really step out and mingle, dancing and waving and crashing your browser if there were too many habbos present. You decorated your room with “furni” – which was an obsession among most habbos. You had limited coins with which to purchase furni at the store, or you could actually use real human earth money to buy more coins to buy more furni, meaning the Habbo Hotel is the grandfather of all other browser-based games that we are all familiar with now: freemium games. Much like Farmville and things like it, this was never really a game. But people still PLAYED TO WIN. For those of us with integrity and dignity (but not so much dignity that we would not be in the hotel to begin with), we never used actual money, of course. We obtained furni via trading with new friends, old friends, and fools. To instigate a trade was to give a showing of good will and friendship. A giant hand appeared on both participants’ screens and items were on display to give to each other. It was an elegant process, and one that you could accidentally mess up easily if you were an aforementioned fool. So many times were cries let out of “U STOLE FROM ME” even though it was impossible, or “I DIDNT MEAN 2 GIEV U THAT” in which case you could be an uncaring habbo of fortune, or a good sport who just gave the stupid objects back and then count to ten as your browser crashed again. Billy always treated trading as the serious business it should have been treated as. He began his Habbo life with One Chair, and thanks to careful trading, a little grifting, and some words of persuasion, he ended up with a pretty fine room. Your success in Habbo Hotel relied heavily on your ability to trade. That giant hand may as well have been the Hand of God. Furni was a mania, it was a golden treasure trove of delights that could cause social popularity, or social suicide. “Mo’ furni, mo’ success” was the case in and around that hotel. I am not really sure how so many of the habbos had so much furni, but thinking back and knowing now what I know (which will be revealed in the last section – a little foreshadowing for you), it was probably all purchased by pedos who intended to use it as bait for luring children into their clutches. It was impossible to really know how old anyone was at the hotel, however, so we always figured that it was mostly just a bunch of legitimately illiterate British teens and older folk who were also illiterate. But, back to the possessions. There would be contests with furni for prizes. New objects were released continually. The very word “furni” was on the pixels around every poorly-drawn habbo mouth, where the lips should have been but were not. “U HAVE FURNI?” “CAN I HAVE UR FURNI?” “GOT N E FURNI 4 ME?” “WILL WORK 4 FURNI” – the stream of furni talk was endless. A quick glance at room names revealed that many were named after that pixelated god, the glory and goal of most, if not all. Me? I didn’t really care. Billy Holiday, on the other hand, grifted much bounty and loot. His room’s decor can speak for itself. I did eventually amass a small fortune in furni, but it was only because we had a friend who actually worked as a moderator for them, and I eventually guilted him and cried a lot until he supplied me with a paltry tribute. What of the Habbos Themselves? Ugh. What a bunch of horrible people. As previously mentioned, we did all of our business on the UK Habbo, I believe because it pre-dated the American version. There was a bit of culture shock when we realized that the British Youth were somehow even more irritating than their American counterparts. Shrill cries (of course they were shrill, you could tell they were shrill) asking R U CHAV and N E FIT CHAVS and other intelligent conversation starters filled every room. There was not much variety. Also, there were filters set in place so that you couldn’t let a swear out. Any curse words, or any number of seemingly arbitrarily selected words, were exchanged to the habbo word “bobba.” The morons using the hotel might have been a bunch with astonishingly low IQs, but they sure did excel at creatively swearing. Requests to see p.enis could be found in every corner of every public gathering place. Tempers turned hot, and accidental shouts of “YOU MOTHERbobba” might be chanced upon. It was a wonderland. Part of the fun we had was to comb through the masses in order to find the few other people like us, who were there as though it was a carnival, laughing and wide-eyed at the freaks. And the freaks far outnumbered the spectators, let me tell you. Actually, sadly, we were very often viewed as the freaks, as we insisted upon speaking in full, correctly formed sentences. We had better syntax and delivery of lines at Habbo Hotel than we had anywhere else on this Internet, barring emails sent in a professional manner to professional places. The common habbo would usually react to this sudden intrusion of intelligible language somewhat negatively, demanding to know if WE WUZ POSH. Properly capitalized and punctuated communication was seen as threatening, annoying, and indication that we were snobs there to end their good times and they were not interested in taking that. But then, they realized that we were not trying to stop them. That is when some of them would pity us and try to teach us how to not be so unfathomably lame. Trust me when I tell you that lessons were not learned by either party. To this very day, I refuse to dwell on the meaning of any of that. God. If those kids could have come up with a way to shorten the word “a,” they would have. A nice little side-game we played while on Habbo was seeing how long we could hold out without having to twitch due to anger. 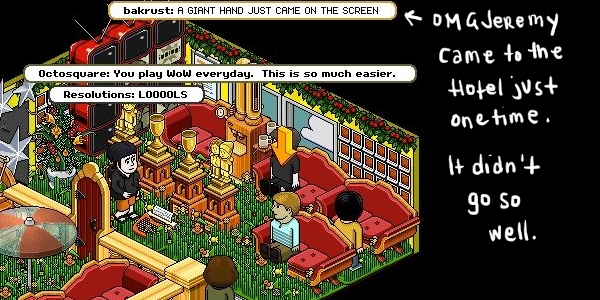 Anyway, yes, what I am saying is that part of the fun we had on Habbo Hotel that kept us coming back was that we enjoyed writing in full sentences. HOO BOY! Want to Go to Habbo Hotel TODAY? I think several years ago, they actually combined the UK Hotel with the American one, or at least barred us from getting to the UK one, costing us all of our furni, and pets, and ability to hobnob with the Great Brits. And there was a while where I was not sure if the entire operation was long for this world. Our old hotel made the news just a few years ago − for the worst reasons. The news agencies were honestly shocked to discover that a place on the internet was a haven for horrible things, but the rest of us were not so shocked. Well, we are a little shocked that the Habbo Company never really tried to put a stop to it… But I guess it will be up to the Courts to decide how criminal their negligence was. Recently-ish, that hotbed of steaming sin has been reformed and “unmuted” and seems to actually be… okay? In our most recent visits to the hotel, there are few shrieking teens, everyone is fairly polite, people are actually kind to each other and friendly. What is this place?? Well, don’t worry, because we will be telling you stories, old and new, about the goings-on in this old hotel. And one of the stories reveals something that not even the news media could have predicted in terms of scope and scandal and general weirdness. I am so glad that Billy and I randomly decided to revisit the hotel one last time (we thought), for it gave us a surprise that still stands alone at the very peak of bizarre internet experiences – that is, until we went back a month or two ago. Played since 04 mate and it has changed dramatically, if you would ever like to play and for me to show you around give me an email. habbos has made big changes and I’m sure you and Billy will get a kick out of it!